360 pages | 326 Color Illus. New Dimensions in Photo Processes invites artists in all visual media to discover contemporary approaches to historical techniques. Painters, printmakers, and photographers alike will find value in this practical book, as these processes require little to no knowledge of photography, digital means, or chemistry. Easy to use in a studio or lab, this edition highlights innovative work by internationally respected artists, such as Robert Rauschenberg, Chuck Close, Mike and Doug Starn, and Emmet Gowin. 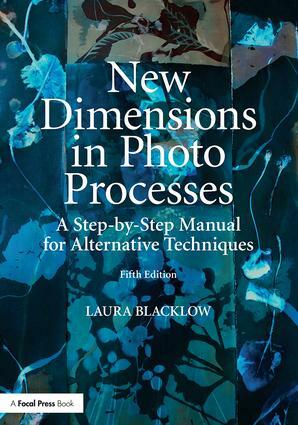 In addition to including new sun-printing techniques, such as salted paper and lumen printing, this book has been updated throughout, from pinhole camera and digital methods of making color separations and contact negatives to making water color pigments photo-sensitive and more. Reproduce original photographic art, collages, and drawings on paper, fabric, metal, and other unusual surfaces. Safely mix chemicals and apply antique light-sensitive emulsions by hand. Create imagery in and out of the traditional darkroom and digital studio. Relocate photo imagery and make prints from real objects, photocopies, and pictures from magazines and newspapers, as well as from your digitial files and black and white negatives. Alter black and white photographs, smart phone images, and digital prints. Laura Blacklow teaches at the School of the (Boston) Museum of Fine Arts at Tufts University. A professional artist for over 40 years, she has received numerous grants and awards; her manipulated photographs are in the collection of the Addison Gallery of American Art, Harvard University's Fogg Museum, Chicago’s Museum of Contemporary Art, and Polaroid’s International Collection. Her work has also appeared in Christina Z. Anderson's Gum Printing and Other Amazing Contact Printing Processes (2017), Robert Hirsch's Exploring Color Photography (2015), and Robert Hirsch's Light and Lens: Photography in the Digital Age (2012).